Seven solid phase sorbent materials with reversed-phase, mixed-mode interactions (ion-exchange and reversed-phase), and molecularly imprinted polymers (MIP), namely Oasis HLB, Oasis MAX, Oasis MCX, Bond Elute Plexa, Bond Elute Plexa PAX, Bond Elute Plexa PCX, and SupelMIP sorbents, were investigated. The present study was focused on the retention and elution of pharmaceutically active substances based on several analyte-sorbent interaction properties. Basic drugs, such as β-blockers (i.e., atenolol, pindolol, acebutolol, metoprolol, labetalol, and propranolol) were selected as the model compounds for this study. These compounds are frequently encountered in anti-doping tests. The extraction efficiencies of the individual sorbents were compared based on the recovery of known amounts of the targeted analytes in a metered elution volume (500 μL) in three separate elution fractions. The elution efficiency of the total amount of the target analytes on various sorbents was not appreciably influenced by the volume of eluent required for complete elution. Based on the small matrix effects and clear baseline, SupelMIP was the most suitable sorbent for urine analysis. The relative analyte recoveries of the SPE-HPLC procedure proved satisfactory for the range from 94 % to 105 %, with an RSD ranging from 2 % to 4 %. The regression equations for all of the targeted compounds exhibited excellent linearity (r 2 > 0.9991) over the range of 10 to 1000 ng mL–1. 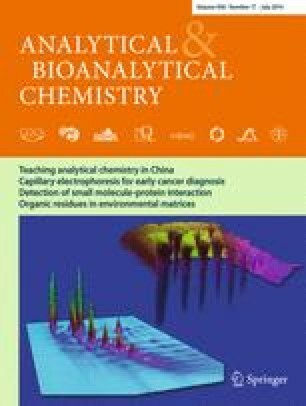 The limits of detection and quantification for the selected β-blocker compounds in urine were in the ranges of 0.6 to 2.0 ng mL–1 and 2.0 to 6.7 ng mL–1, respectively. This work is co-financed by the European Social Fund and the state budget of the Czech Republic. Project no. CZ.1.07/2.3.00/30.0061 (FAF12).